Microweber is a very user-friendly and intuitive open source website builder built with a drag-and-drop functionality and in the same time, it functions as a very robust and comprehensive content management system (CMS). Aimed at small and medium-sized businesses (SMBs) as well as freelancers, Microweber provides users with a platform that simplifies the creation and management of websites and online stores. The platform is built with an integrated online shop wizard that guides users on building and maintaining their online stores and websites. All they need to do is upload their products and services and start selling. With its impressive CMS features, anyone with little to no website designing and development skills can craft professional looking websites with great content. Other features include payments, client lists, order status, order notification, shipping, and custom fields. 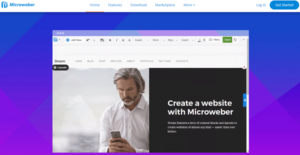 Microweber offers you a new generation CMS and website builder that run in an open-source environment. It is built with a real Drag & Drop functionality that makes creating and managing online stores and websites a total breeze. Microweber is so easy to use that even those who haven’t worked on codes and website development will find the software highly intuitive and easy to use. Microweber is loaded with the advantages you might see in popular content management systems and website builders such as Wordpress, Drupal, and Joomla to name a few. It is Microweber’s drag and drop interface that separates it from other similar platforms With it along with Microweber’s custom developed WYSIWYG (what you see is what you get) editor, you can drag and drop almost everything, like layouts, images, banners, content, and more. You have total control over what you can display on your screen and how you want it. This drag and drop feature makes designing and editing your website or online store so easy that it decreases your reliance on third-party developers to build, edit, and manage your website, saving you huge money on operational and maintenance expenses. As Microweber is an open-source platform, you and anyone else can make tweaks and changes to your system, resulting in a highly customized website the suits your needs and other business requirements. What Problems Will Microweber Solve? Many companies struggle with high software costs – Microweber CMS and Website builder is a great option for them, as it greatly reduces spendings (both financial and in terms of resources) and allows them to build their online presence literally in a matter of hours, and even without any technical knowledge or help. This is possible, absolutely for free. Microweber CMS and Website Builder is also targeted at developers, freelancers, and web design companies. Many of Microweber’s biggest competitors are not open source, meaning any programmer using them cannot freely modify the code. This is not the case with the Microweber system. It is open source, which guarantees greater flexibility, independence, and security. One of the areas where Microweber excels is its “Live Edit” functionality – this is actually the fish on the cake of the product, and has enjoyed fantastic feedback from users, who often find it hard to deal with the complicated UI and actions required by other CMSs. If you are interested in Microweber it might also be a good idea to investigate other subcategories of Best Content Management Software gathered in our database of B2B software reviews. Every enterprise has its own characteristics, and can call for a special Content Management Software solution that will be fit for their company size, type of clients and staff and even individual industry they cater to. It's not wise to count on getting an ideal app that will work for each company no matter what their background is. It may be a good idea to read a few Microweber reviews first and even then you should keep in mind what the solution is supposed to do for your company and your staff. Do you require a simple and straightforward app with just basic functions? Will you really use the complex tools required by pros and large enterprises? Are there any specific tools that are especially useful for the industry you work in? If you ask yourself these questions it will be much easier to find a trustworthy service that will match your budget. How Much Does Microweber Cost? Microweber is a free online site builder with CMS capabilities with no basic or enterprise pricing packages. That said, it accepts donations from its users. We realize that when you make a decision to buy Content Management Software it’s important not only to see how experts evaluate it in their reviews, but also to find out if the real people and companies that buy it are actually satisfied with the product. That’s why we’ve created our behavior-based Customer Satisfaction Algorithm™ that gathers customer reviews, comments and Microweber reviews across a wide range of social media sites. The data is then presented in an easy to digest form showing how many people had positive and negative experience with Microweber. With that information at hand you should be equipped to make an informed buying decision that you won’t regret. What are Microweber pricing details? What integrations are available for Microweber? The CMS can be integrated with any 3rd party service or payment gateway which has an API or embed code. If you need more information about Microweber or you simply have a question let us know what you need and we’ll forward your request directly to the vendor.